A development that has put under scanner the admission procedure of IITs, the Delhi High Court today issued notices to the Ministry of Human Resource Development, IIT Council and Joint Admission Board (JAB) on a petition alleging irregularities, tampering and fraud in the system. And the move has come three days ahead of the IIT-JEE 2010, in which about five lakh students are slated to appear on April 11. He has braved threats for taking on the IITs and slogged three years to get the institutes to answer his RTI queries. For Rajeev Kumar, it’s all in the game that started in 2006 when the 50-year-old computer engineering professor at IIT Kharagpur decided to fight for transparency in the IIT admission process, which has remained opaque since 1961 when the institutes were set up under the central act. BJP president Nitin Gadkari has instructed his office-bearers to tour the country at least eight days in a month. He was addressing the first meeting of his office-bearers at the party headquarters here today. Law Minister M Veerappa Moily today took strong exception to Karnataka HC Chief Justice PD Dinakaran’s refusal to go on leave as advised by the Supreme Court Collegium in view of the impeachment proceedings in Parliament for his removal. The Centre today approved a proposal to introduce legislation on prevention of torture in line with the treaty adopted by the United Nations. The decision was taken at a Cabinet meeting chaired by Prime Minister Manmohan Singh. Three days after the massacre of 75 CRPF jawans in Chhattisgarh, the government is tweaking its strategy to deal with Naxals. The Ministry of Home Affairs today appointed former IPS officer EN Rammohan to conduct an inquiry into the circumstances leading to the ambush and killing of 75 CRPF personnel in Dantewada on April 6. The spurt in Maoist activity has cast a shadow over the ongoing political movement for a separate Telangana state. The Dantewada ambush, the deadliest in the history of the Maoist movement, sent shock waves in Andhra Pradesh where Naxalites have been trying to use the Telangana agitation as a springboard to bounce back into reckoning in the state that was their stronghold once. Accusing Punjab Chief Minister Parkash Singh Badal of attacking the independence of the Punjab Public Service Commission “with ulterior motive”, its chairman today moved the Punjab and Haryana High Court. Prime Minister Manmohan Singh and his UPA government today came under heavy firing by the left parties against rise in prices of the essential commodities today. Addressing a gathering before the Income Tax office in the Esplanade area, Left Front chairman Biman Bose, who is also the CPM state unit secretary, accused Singh of criticising them for protesting against the price rise, instead of taking appropriate steps for lowering down the prices. Notably, this is the first comprehensive PIL ever filed against IITs, which raises questions over the admission procedure — from “arbitrary” fixing of cut-offs to “benefit” some students and eliminate top scorers, unattended errors in question setting and evaluation, tampering and shredding of optical response sheets (ORS) in unexplained haste, selection of faculty wards and closed admission counselling resulting in vacant seats. Even today, five to 20 per cent vacancies exist across IITs despite huge demand for seats. Slamming the current “non-transparent” admission system, petitioner Prof Rajeev Kumar of IIT Kharagpur sought court’s intervention for a special investigation team (SIT) inquiry into the alleged irregularities in all JEEs from 2006. He demanded that a committee of independent experts, not from IITs, be formed to fix rational cut-offs, which students must attain to qualify for admissions to the institutes. The current system of fixing cut-offs is ad-hoc. 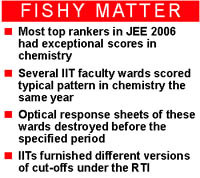 In February, The Tribune had highlighted gross deficiencies in IIT admissions based on the information Kumar had gathered under the RTI on JEEs 2006 to 2009. Shocking revelations followed on how 994 top scorers failed to make it to IITs while low scoring candidates succeeded in doing so. In JEE 2006, brilliant candidates were rejected because IITs calculated cut-offs in a faulty, arbitrary manner. “Those with 156 marks were selected; those with 279 rejected,” the petition states, seeking SIT probe into JEEs, especially 2006, which saw wards of IIT faculty scoring high marks in chemistry. The marks they obtained were in typical patterns which couldn’t have occurred except through ORS tampering, the petition alleges. Kumar also requested the court to institute IIT-JEE reforms under independent experts, rather than a closed panel of four IIT directors, which the HRD ministry recently constituted. Besides, as earlier reported by The Tribune how current IIT practices (they don’t disclose answers on the day of test) aided coaching institutes, the PIL seeks directions to JAB to release model answers soon after the JEE is held. The court has put the ministry and IIT Council on notice for May 19. Armed with RTI, Kumar finally got the highly-secretive IITs to disclose their admission secrets. The information he obtained under the RTI Act now forms the basis of the first PIL against the IIT-JEE system, which has operated arbitrarily all these years. “My battle began when my son missed the IIT seat by three marks in JEE. He got through all other exams. I was curious to know why he missed the IIT,” Kumar tells The Tribune. While his son went on to join BTech computer science at Jadavpur University in Kolkata, Kumar went on to dissect the IIT system, exposing one admission anomaly after the other and forcing even HRD Minister Kapil Sibal to sit up and think. The latter advised him to go to court or represent before the ministry instituted IIT-JEE reform panel. But Kumar had a problem. He couldn’t have represented his case before people who were part of the problem. Hence, his demand to the Delhi High Court to order SIT probe into JEEs for admission to 15 IITs, Institute of Technology, BHU, and Indian School of Mines, Dhanbad. Incidentally, it was on September 5, 2006, when the Chief Information Commissioner ordered the UPSC to reveal its admission procedure that Kumar saw some hope. So started his journey to discover how IITs selected their students. For the first time in 2006, IITs revealed marks students obtained in the Joint Entrance Examination (JEE). “When they released the marks in August, students couldn’t find a pattern to selections. My son with a high aggregate of 224 marks was rejected but a low scorer with 154 got a counseling call,” says Kumar. He eventually forced the IITs to admit before the CIC that there was “no set procedure to determine cut-off marks”. Till date, the institutes haven’t been able to explain how they reached the cut-off in JEE 2006 whereby 994 top scorers were rejected. The court will help, believes Kumar. BJP president Nitin Gadkari has instructed his office-bearers to tour the country at least eight days in a month. He was addressing the first meeting of his office-bearers at the party headquarters here today. BJP parliamentary party chairman LK Advani did turn up but remained a mute spectator, while some important members of Gadkari’s team, including vice-presidents Vinay Katiyar and Hema Malini, gave the meeting a miss. Gadkari had earlier announced that he would want his team members to remain constantly on the move and in touch with the booth-level worker of the party. He reiterated this today. He said the next national executive would be held in Patna in late May or early June. The ostensible reason for holding today’s meeting was to mobilise its manpower to ensure success of the party’s proposed rally against price to be held in Delhi on April 21. Each office-bearer was asked to turn to his respective state to bring enough numbers for making April 21 rally a big success. The participants also passed a resolution mourning the death of CRPF jawans in Dantewada and discussed the Civil-Nuclear Liability Bill as also the Foreign Universities Bill. “The hand of law is quite long to catch anyone. I don’t think Justice Dinakaran is above law,” Moily told reporters who sought his reaction to the developments relating to charges of corruption and judicial misconduct leveled against the CJ. The SC Collegium, headed by CJI KG Balakrishnan and comprising four senior most judges of the apex court, has also recommended the appointment of Delhi HC Acting CJ Madan B Lokur in place of Justice Dinakaran. However, according to legal experts, there is no legal provision under which a HC CJ can be forced to go on leave. Ambika Soni, Information and Broadcasting Minister, said the Prevention of Torture Bill, 2010, would be a step towards ratification of the 1975 UN treaty against torture. India is a signatory to a convention against torture and other cruel, inhuman and degrading treatment. For ratification of convention, India needs to bring a domestic law in tune with the provision of the convention, the minister told reporters after the meeting. So far, the Indian Penal Code neither defines torture nor makes it criminal as called for by Article 4 of the convention. In some other decisions taken by the Cabinet, monetary outlay for the disaster risk management programme has been increased and over Rs 1,500 crore set aside for digitalisation of All India Radio and Doordarshan. 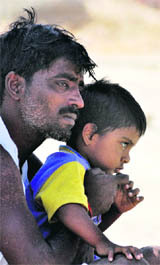 The additional outlay was necessitated to extend the programme to seven more Tsunami-affected districts in Tamil Nadu. It will also be diverted to assist Arunachal, Manipur, Mizoram, Nagaland and Tripura construct emergency operation centres and provide them basic equipment and critical emergency rescue kits, Soni said. The list of changes includes: segregation within the CRPF to have specialist anti-insurgency units, which will be trained to “attack first”; introduction of unmanned aerial vehicles (UAVs) for surveillance; more choppers; and re-training of men on the pattern of Indian Army before induction. “Operations will go on…rather they are still on,” said well-placed sources, adding that 10 such battalions had been trained specially for the “attack first” policy which is the dictum of the Army and the BSF in dealing with adversaries. The training will include ramping up of infrastructure with firing ranges and also the use of the existing training facilities of the Army in Jungle warfare. The Army’s jungle warfare expertise is such that even the Chinese Army conducted a joint exercise with India last year. For effective use, the CRPF - comprising 2.30 lakh personnel - will be segregated into two parts. One will help the state governments in maintaining law and order duties, while the other comprising younger men will deal with insurgents. Notably, sources said the CRPF, in an internal assessment, made it clear that its force had spread out “too thin” in the naxal belt as compared to the influx of men in Jammu and Kashmir. At present, there are some 18,000 men in Chhattisgarh. Just the Bastar area alone is around 30,000 square km and a part of it, what is known as a “liberated zone”, is totally under Naxals control. At the moment the deployment of men is “skewed” and made in a haphazard manner, said sources. The operations in J&K are carried out in the area which is half of Bastar’s. However, there are 60,000 CRPF men alone, besides the Army and the BSF with their latest equipment like rocket launchers, UAV’s to track movements and facilities to intercept mobile and satelitte phones. The Intelligence Bureau and military intelligence keep a sharp focus on J&K, which is not the case in the Naxal-belt, said sources. The CRPF has also made it clear that the state governments have to start raising special operations groups of its local policemen like in Andhra Pradesh and J&K. The local boys know the population and glean out good information from villagers which comes handy. Sources said the thinking in the government remains to take back the “liberated zones” but without spreading out the forces and backing them with “technological force multipliers”. The first major step will be induction of UAV’s to keep track of movements. Modern day UAV’s carry infrared sensors to pick out metallic objects (guns and ammunition) even from underneath a tree cover. A UAV can hover above a designated spot for hours while beaming back live pictures in the control room using its high resolution cameras. As am immediate step, the Home Ministry has asked for more choppers from the IAF for quicker deployment of men. Two of IAF’s MI-17 choppers are on duty in the naxal-belt while a couple of Dhruv choppers are also attached for duty. Rammohan, a former Manipur DG, has been asked to submit a report within 15 days, the ministry spokesperson said tonight. The inquiry shall establish the circumstances preceding and the sequence of events leading to the incident. It will reconstruct, as far as possible, the actual events that took place on that day. Crucially, it will analyse and establish the command structure and the specific levels which took relevant decisions leading to the incident. It will examine the quality of the training imparted to the relevant companies of the CRPF and the details of standard operating procedures issued to the company. It will examine the response of the state police and the CRPF both during the ambush and the post-ambush relief and rescue operations. The inquiry shall also suggest measures to mitigate the lapses, if any, which are documented by the enquiry officer so that such incidents do not reoccur. The spread of Red Terror in neighbouring Chhattisgarh, Jharkhand and Orissa raised fears of similar violence in the event of formation of a separate Telangana state. It gives credence to the argument of those opposed to AP’s division that creation of a separate Telangana state could mean yielding ground to Maoists. “We can effectively tackle ultra left wing extremism only when the state remains united. If Telangana is separated, there is bound be an escalation in Naxalite violence, seriously affecting the development,” the Congress MP from the coastal city of Vijayawada said. Cutting across party lines, the leaders from Rayalaseema and coastal Andhra regions have been arguing that Maoists would gain ground if a separate Telangana state was formed. The present dispensation, headed by K Rosaiah, who also hails from coastal Andhra, shares a similar view. In fact, the government had told the Supreme Court recently that Maoists had infiltrated into the Telangana agitation and had a key role in the violent incidents that rocked Osmania University campus here. Sinha’s counsel has alleged that the Badals — Parkash and Sukhbir — “sent many emissaries to him (Sinha) during the selection of the medical officers, who requested and intimidated him to favour certain candidates, but he (Sinha) refused them”. Sanjit Kumar Sinha, a former IAS officer, has demanded a probe by the Central Bureau of Investigation or a retired high court judge into the allegations levelled against the commission in selection of medical officers. Sinha has made Chief Minister Badal, his deputy, Sukhbir Singh Badal, and vigilance chief Sumedh Singh Saini a party to the litigation. In all, Sinha has filed the petition against six respondents. The high court has directed that the petition be placed for hearing before Justice Ajay Kumar Mittal tomorrow. In the petition — filed through Bar-at-Law Himmat Singh Shergill — Sinha has alleged that Badal, under a deep-rooted conspiracy, has “put the commission under the scanner of an official, who is directly under his control, thereby violating the constitutional safeguards, which the commission has been granted by the Constitution of India”. Going into the political background behind the “conspiracy”, Sinha has said: “Ever since the present government headed by Parkash Singh Badal was formed, he has been desperate to dislodge the present Punjab Public Service Commission and appoint a commission of his choice, so that he can get candidates of his choice selected in the state services”. Prime Minister Manmohan Singh and his UPA government today came under heavy firing by the left parties against rise in prices of the essential commodities today. Addressing a gathering before the Income Tax office in the Esplanade area, Left Front chairman Biman Bose, who is also the CPM state unit secretary, accused Singh of criticising them for protesting against the price rise, instead of taking appropriate steps for lowering down the prices. Bose alleged that the Prime Minister and the UPA leadership had sold themselves to the big businessmen and traders. They were allowing profiteers and black-marketers to run the country’s market economy at the cost of the miseries of the poor people. He warned the people against the onslaught of the UPA leadership. He announced that the left parties and other anti-Congress (l) parties would launch massive movement, including today’s observance of the Bharat bandh against price rise, and the final decision would be taken at a rally in New Delhi on April 12. Senior CPM leader Benoy Konar alleged that Sonia Gandhi and the PM were running the nation by surrendering themselves to the capitalists and the bourgeois, which were dictating the country. He criticised Trinamool leader Mamata Banerjee for serving the vested interests. He alleged that the TMC leadership, the governor and Maoist leader Kishenji were jointly involved in a conspiracy of ousting the left front government from the backdoor. He warned that there would be large-scale bloodshed and killing if their peaceful protest and agitation were forcibly stopped.